MAD GIGA mouse pad & keyboard wrist rest support protect your hands and wrists while working. From office to home and entertainment, our daily activities are deeply connected with computers, pcs, laptops. It is well known that this modern lifestyle causes pain and postural problems. Our madgiga mouse and keyboard set is created to prevent wrist and hand's pain and prevent some problems such as tenosynovitis and carpal tunnel syndrome. Keeping your hands and wrists at the right angle will improve your movements and your work efficiency at the same time. Made to last long, made to support you! *Suitable for office worker and game lovers. *Bigger size and fits with most computers and notebooks. *Memory foam structure, slow bounces back and not easy to deform. *Nice ergonomic shape, comfortable for typing long essays, and for long periods, prevent you from getting carpel tunnel. *Anti-slip base side, stable and prevent sliding or unwanted movement when typing, doesn't slide around at all. 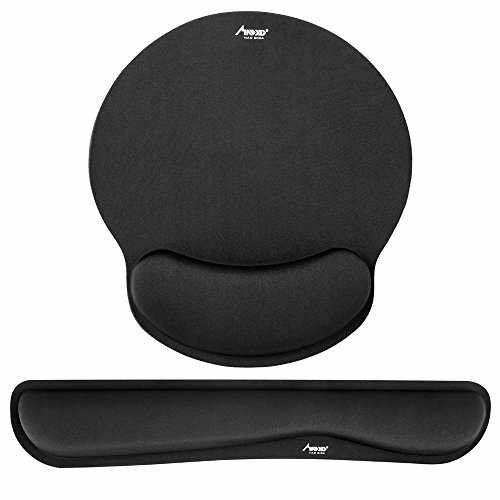 SOFT MOUSE PAD SET -- Made of improved super smooth & breathable material and comfortable memory foam to the pads, supply lightweight, comfortable, durable and ergonomic touch, slow bounces back and not easy to out of shape and Ideal for longer hours of use. ANTI-SLIP KEYBOARD SUPPORT PAD -- Non-skid rubber base provides heavy grip preventing sliding or unwanted movement for keyboard and mouse pads, double sticking and press handing for edge to supply flat and smooth edge and will not roll up nor split open. LARGE MOUSE PAD & KEYBOARD WRIST PAD -- Fits most computers or notebooks or mouse, improve hand and wrist posture, avoid joint and wrist problems and release your elbows and shoulder stress for long hours of use on the computer. RISK FREE - LIFETIME YEARS WARRANTY, we are committed to our 100% customer satisfaction, if you have any other questions, please feel free to contact us.